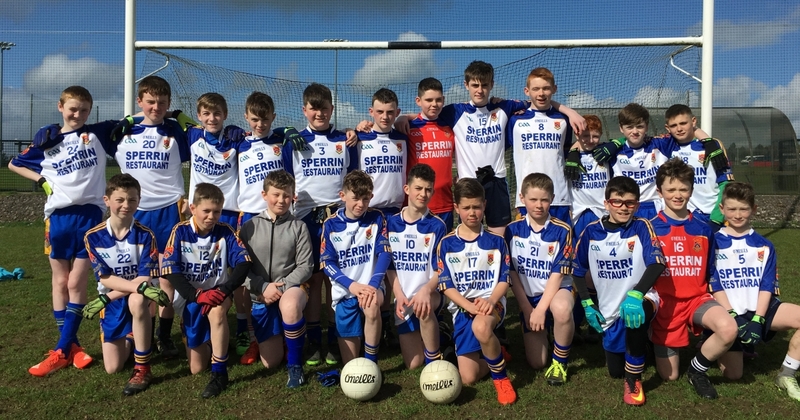 The under 13.5 boys from Omagh defeated Abbey Vocational School, Donegal Town, in a pulsating semi-final last Friday 7th April in Castlederg. Sacred Heart showed their intent right from the off, as they came flying out of the blocks and raced into a 0-3 to 0-0 lead, through points by Pearse Goan, Matthew Hayes, and Cathair Conway. However, the Donegal side also showed their potency up front by breaking through for a goal with their first attack. Faced with having to play ‘up the hill’ and against the wind in the second period, Sacred Heart knew that they would now have to dig, deeper than ever before, if they were to take their College to the coveted Ulster final. The Donegal boys, though, were not going to just step aside. In fact, they quickly made the wind advantage count, as they pointed the first score of the restart, to extend their advantage to 4 points. The next 20 minutes seen neither side troubling the score-board, and even though Sacred Heart continued to dominate proceedings, it took a fine last ditch block by Aidan McSorley, to prevent the Abbey from going 7 points clear. With 5 minutes left on the clock it looked like Sacred Heart were going to rue their missed chances, however, the west Tyrone boys refused to be denied. They took total control of the final stages by emphatically scoring 3-1 without reply, courtesy of a point by Ciaran McArdle and goals by Pearce Goan, Matthew Hayes, and finally corner back Aidan McSorley. As referee Stephen McNamee blew the final whistle, the Year 8 and 9 pupils of Sacred Heart had secured their College an historic first ever appearance in an Ulster Schools Final. Final Score- Sacred Heart Omagh 3-11 v Abbey Vocational Donegal 4-1. They now await the winners of Loreto Coleraine and De La Salle Belfast. Sacred Heart: C Kelly, A McSorley, T Cox, T Mullan, S McKenna, C Conway, T Campbell, P Goan, F Glackin, O Campbell, S Drumm, C McArdle, F Patterson, T Cunningham, M Hayes. Subs: B McLaughlin, E Donnelly, J Gallagher, C Connolly, M Bradley, A.J. Moore, S McCaul, J Shi, R Simmonds, D Arkinson.